The purpose of the study is to gain a holistic view of the global industrial microbiological QC market in terms of various factors, including regulatory reforms and technological advancements, which are influencing the market. The market has been segmented into ‘applications’, ‘technologies’, ‘consumers’, and ‘regions’. The scope of this report is centered upon conducting a detailed study of the products allied with the global industrial microbiological QC market. The market has also been broadly classified into product revenue, testing revenue, and testing volume for each of the aforementioned segments. 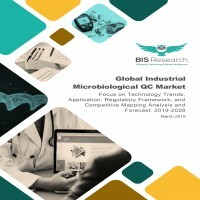 In addition, the study also includes the exhaustive information on the unmet needs, perception on the new products, competitive landscape, market share of leading manufacturers, growth potential of application, technology, consumer, region, and companies, as well as other vital information with respect to global industrial microbiological QC market. The report presents the reader with an opportunity to unlock comprehensive insights with respect to the market and helps in forming well-informed strategic decisions. The research uncovers some of the substantial parameters that must be taken into consideration before entering into the market. The research study highlights the factors governing the industry attractiveness with Porter’s Five Forces for a comprehensive understanding of the global industrial microbiological QC market. Moreover, the study includes detailed product mapping, market estimation, and analysis of key trends in multiple geographical regions, growth of global industrial microbiological QC market in each region for different applications, and the key strategies and developments by the prominent manufacturers. • What are the major market drivers, challenges, and opportunities in the global industrial microbiological QC market? • What are the underlying structures resulting in the emerging trends within the global industrial microbiological QC market? • How is each segment of the global industrial microbiological QC market expected to grow during the forecast period and what is the anticipated revenue generated by each of the segments by the end of 2028? • What are the key developmental strategies which are implemented by the major players in order to sustain in the competitive market? What are the key standardization implications in developed regions for industrial microbiological QC products? • What are the countermeasures in case of failing QC procedures for each industry? • Who are the leading players with significant offerings to the global industrial microbiological QC market? What is the current market dominance for each of these leading players? • What is the expected compound growth rate witnessed by the leading players in the market during the forecast period 2019-2028? Which industrial microbiology QC product type is anticipated to have the most promising growth? • What are the key applications in the global industrial microbiological QC market? What are the major segments of these applications? What technologies are dominating these application segments? • What are the major technologies that are employed in the global industrial microbiological QC market? Which is the dominating technology? • Who are the primary consumers of the global industrial microbiological QC market? Which is the fastest growing consumer segment in the global industrial microbiological QC market? • Who are the key manufacturers in the global industrial microbiological QC market, and what are their contributions? Also, what is the growth potential of each major manufacturer? • What is the scope of the global industrial microbiological QC market in North America, Europe, Asia-Pacific, Latin America, and Rest-of-the-World? The key manufacturers who have been contributing significantly to the global industrial microbiological QC market include 3M Company, Becton, Dickinson and Company, Bio-Rad Laboratories, Inc., Biolog, Inc., bioMérieux SA, BIOTECON Diagnostics GmbH, Bruker Corporation, Charles River Laboratories International, Inc., Danaher Corporation, Merck KGaA, Novacyt S.A. (Primerdesign Ltd.), QIAGEN N.V., R-Biopharm AG, Sartorius AG, Shimadzu Corporation, Sysmex Corporation, and Thermo Fisher Scientific Inc., among others.